One of the most important elements in a room is the lighting. Not only for obvious reasons, rooms need various types and sources of light, but I love lighting because of how much personality it can bring to a space! I like my interior lighting to be unique, but I can’t spend a fortune on every room. I’ve seen some awesome but expensive lighting that I just can’t justify when I have a whole house to update. I’m so glad so many of you liked the two lights we put in our kids’ bathroom! I’m really happy with them. As I mentioned in the post about them, I got my bathroom lights at Lowe’s. Very affordable at under $30 a piece. 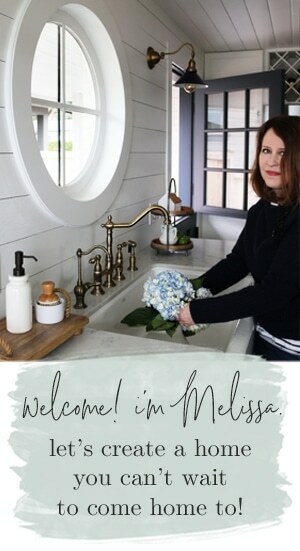 I’ve had so many questions about all the new lights I’ve been adding to my house and where to find other affordable but great looking options. The few lights I’ve added to my house so far have been actually outdoor lighting. Not sure why, but outdoor lights have always looked way more interesting to me! I always look in the outdoor lighting sections first! This lantern in my dining room came from Pottery Barn in their outdoor lighting section of their website. It isn’t available right now, but you can watch Pottery Barn for similar styles like this. It wasn’t necessarily cheap or “affordable” but I had a gift card so for me it was a deal! Not a day goes by that I don’t look at my lantern and love it! For some lighting, paying a little more if you have to might be worth it because of the the focal point statement it will be. Another great way to get a unique light is to find one you like the shape of and personalize it with paint. 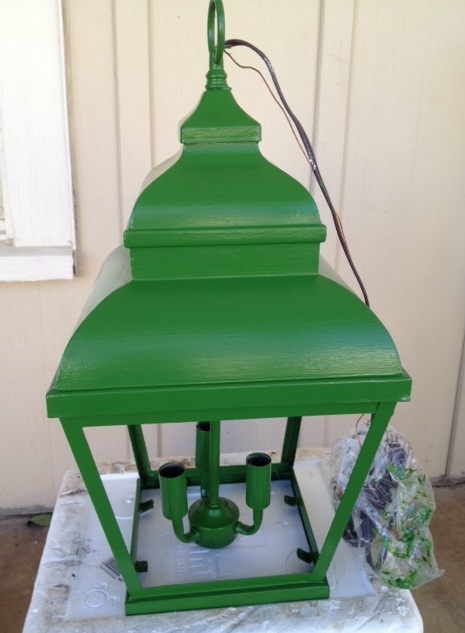 My friend Holly Mathis has a client who pumped up the personality of this lantern from Bellacor by painting it green. I adore it!! You can find Holly’s post on the Bellacor lantern here. The lights I have above my stairs (see photo above, I haven’t posted about them yet!) are outdoor lanterns as well. I was so happy with the quality, they are a great size and really beautiful in person! I got them on some super sale over Thanksgiving weekend at CSN Lighting online. In addition to looking for outdoor lights to use inside, I have many times gone to the ReStore, thrift store, or an antique store to find lights and then have them rewired. I don’t tackle that myself, although I know it isn’t necessarily difficult. I just feel safer having the professionals rewire lighting. It thrills me that now you can find affordable but cool lighting at regular places like Lowe’s or Home Depot! I got this cute little lantern (above) at Lowe’s in their outdoor lighting section. I just needed a little light above my painting. I wanted it to have personality, but not steal the show from the painting. It was awesome to find something readily available and affordable locally so I could have it home and installed right away. Home Depot is carrying a great new line of lights that are pretty fun too. So, have you found other sources for great looking affordable lighting? Please share in the comments! I’d love to know and I bet the readers would too! 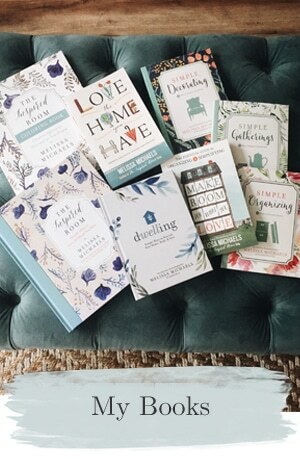 ***Update: see this new post with all the lighting sources in my home currently! The top light is also from Home Depot. I agree with you. Lowe’s and Home Depot have some great lighting options at affordable prices. I tend to lean towards Lowe’s for more stylish options though. I’ve seen some good deals at Overstock too. And, I’ve also bought lights off of Craigslist and Ebay before. I used to lean towards Lowe’s as well, and I wonder if that is why Home Depot has a new line of lights! I’m excited to see what they have now! Home Depot is always the first place I look for affordable lighting. 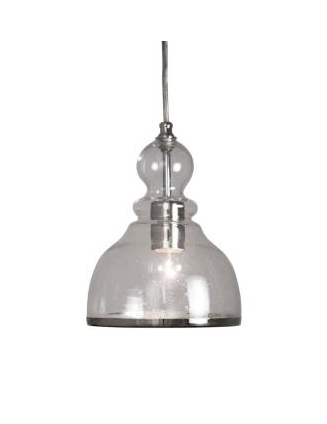 Recently bought a dining room fixture HALF PRICE, so it was under $100 (CANADIAN$$$). A terrific selection at an affordable price. I am also a Home Depot fan, and I do especially love the vintage-y lighting they have available. I would probably do some thrifting to find a cool light fixture first, and maybe search Ebay or Craig’s list. There is so much you can find that way. 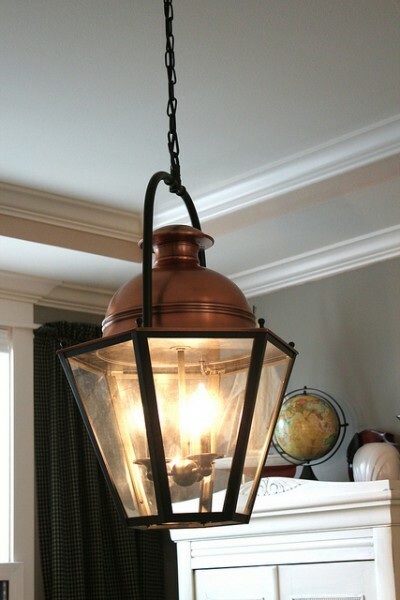 In the case of lantern style light fixtures I’ve seen them in all price ranges and depending on their use you can save some serious dollars by shopping around. 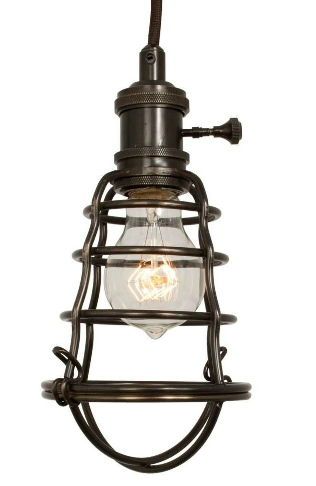 The site, Copy Cat Chic often features lantern fixtures that are the identical knock off of a pricier version. I love your lantern. That very last light on your page the white pendant light? They have those at Ikea too, in silver, black and white and they are cheaper than home depot. They are called foto, and we put in 2 silver ones in our kitchen. Thanks for sharing! The Habitat for Humanity ReStore is an excellent source of used lighting. 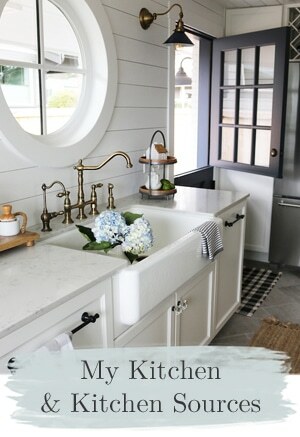 They have t-o-n-s of the outdated brass fixtures that are just begging for a little spray paintin’ love. 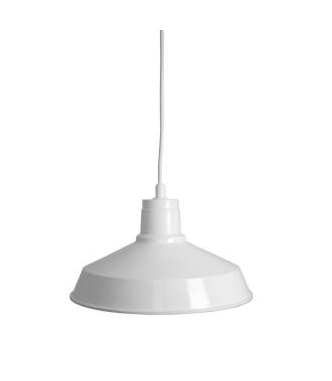 I saw something online the other day where a gal had taken a vintage metal colander and used it upside-down as a lamp shade over a pendant-type light. SO adorable. I’m gonna have to try that. I love looking at lighting at the Habitat ReStore as well as salvage shops like ReHouse. 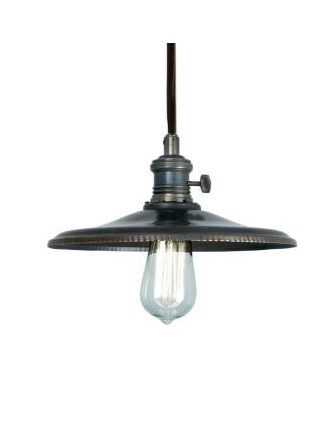 The vintage lighting you can find are in great shapes and priced so affordably. I also like looking at everyday objects and using light kits to turn them into light fixtures like with my wire basket light. Love the lights you used in your kids’ bath. Thanks for sharing. I agree lighting is such an important accessory…it can help set the tone for the room. I’ve gotten some great lighting through IKEA, and at a vintage house parts store in our area. 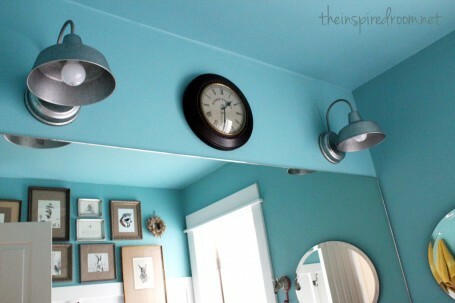 One of my most favorites, a drum chandelier came from Overstock…the price was awesome and great quality. We have an entire board on Pinterest@ http://www.yby5.com dedicated to lighting. Love your lighting…especially the little light over your paiting. Great ideas! With the exception of some pot lights, all the lighting in our house needs to be replaced. I’m not quite ready to tackle it just yet. I’d love to find some vintage lights, but so far no luck. I’ll probably end up in Home Depot. Oh I like the look…and am going to rip off the outside light and substitute it for the one inside. =) I have the one you placed over your painting. It came the closest to the other outdoor lights we have none of which match exactly, though they complement. For the price, I should have been thinking the way you think because it would have saved me quite a few dollars and the look is more in keeping with the room. 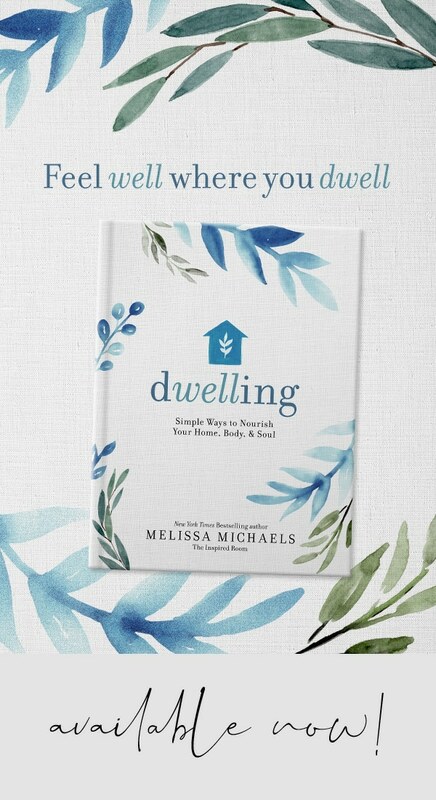 Hey Melissa, Thanks for sharing. I love your lighting. 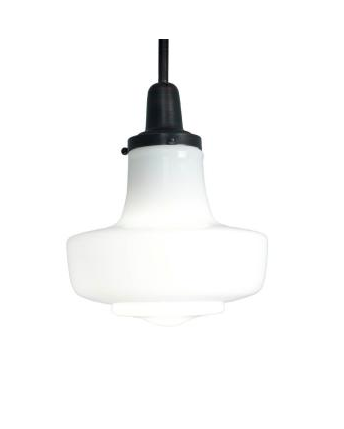 I was really excited to see that Vintage Pendant Light from Home Depot you showed, but my husband just nixed it–again. Alas, and alack, I HATE the fixture in our dining room, but it was my husband’s grandmother’s so it stays. :-) Such a problem, eh? I’ll keep hunting until I find something we both love. When we were building our house Pottery Barn had a dining room light fixture that I absolutely loved but could not justify the $500 price tag. With an idea of what I wanted I started searching the second hand stores and antique malls. I was very pleased when I found almost the same light for $50 at an antique mall. As one commenter said, it is worth investing in key items and since our house has an open concept the dining room light was significant. I would have bought the $500 light if I had not found something comparable, but I didn’t need to. Everytime I look at the light I remember the money that I saved. yes, so true! It is worth the splurge for a significant light fixture, but if you can find something comparable for less, all the better! There are so many knock offs now you really can find some great comparable lights for less! Oooh, I’ve never looked at Lowe’s for lighting! We searched Menard’s and home Depot and finally settled on our vintage art deco inspired flush mount from Home Depot. What a great post!! I am constantly on the hunt for affordable lighting, I have an early ninties house that is really looking a little dated day by day. I have to drive a bit to get to the Home Depot but it looks like it is worth it to take a look. Thanks. I always check out Home Depot and Lowes, in fact the last light you have on this post I purchased this past year in a silver finish with white underside for my laundry room, I got it for $39 back then. Love the look and was excited to find it at such a reasonable price. You showed several lights that I love! Thanks for sharing and a Happy Monday to YOU!! 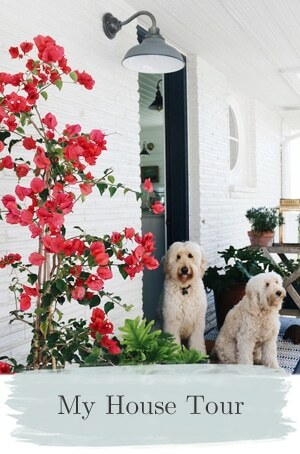 Funny you say that about outside lights b/c I just saw one last week that I loved for outside and am considering for my family room :) Your site looks different? I like it….did you get a new header? Looks good! The twitter thing at the end of the post is cool to! I wish I could do these fun things on blogger. What gorgeous lighting! I have been seeing lights like this all over the internet, and I love it! I particularly like the one you have over your painting! And the ones in the turquoise bathroom. I’m actually on the hunt for some unique lighting. I’m hoping to find some at my local Habitat ReStore. But I never even thought to look at Home Depot and Lowes! I love all your light fixtures! Great selections, Right now I’m on the hunt for an inexensive yet spectacular chandelier to hang over my bed. Wish me luck! I’m very drawn to outdoor fixtures but haven’t jumped on using them inside. Now I will! 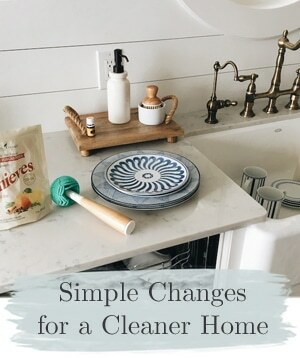 We are redoing almost every fixture in our home and I find that many Pottery Barn fixtures go well with our style, but not our budget when we need that many. Overstock.com has been amazing. Almost identical styles to many PB favorites but a fraction of the cost. They do requite a little more assembly but that truly has meant just a little more time.